You have probably never used “ basil” and “great cocktail” in the same sentence… all that is about to change! 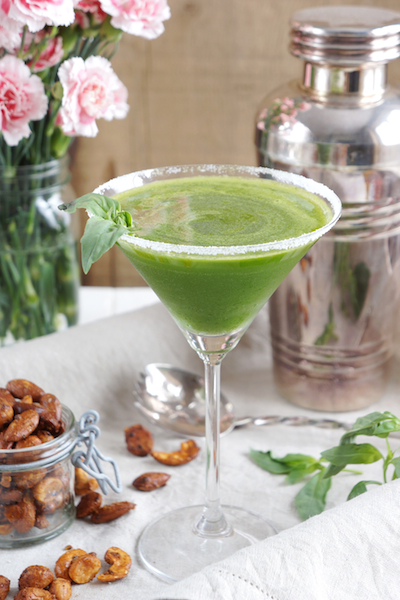 The ‘Basil Ginger Drop’ delivers a refreshingly herbal punch that is sure to get any party started! Visiting my sister in Shanghai last year, I spent a number of drunkenly happy evenings at Sichuan Citizen, a trendy restaurant that boasted a cocktail list that included an incredibly addictive Basil Drop! 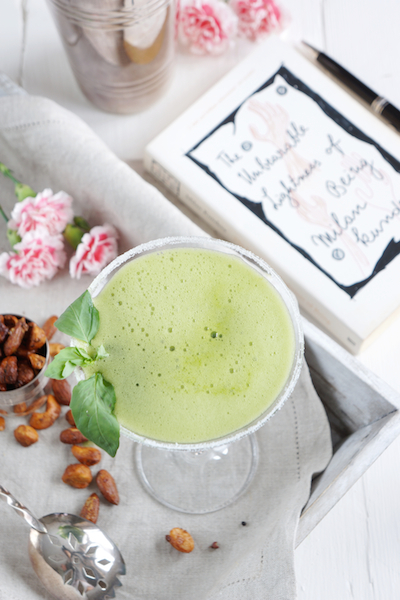 I wasn’t so sure at first, as I normally associate basil with herb gardens and pesto… one sip was enough – I had to recreate these at home! Take 2 martini glasses and moisten their rim with the lemon wedge. Put the sugar on a small plate and gently roll the rim of the glass in it in order to cover the rim in sugar. Add the vodka, lemon juice, grated ginger, basil leaves and sugar syrup/agave nectar to your blender and blend until the basil has dissolved. Add the ice cubes to your mixture and blend until the ice cubes have dissolved. Pour into the sugar-rimmed martini glasses. Decorate with a basil sprig. * To make sugar syrup simply bring 100g / 0.5cup of sugar and 100ml / 3.4oz of water to a boil until the sugar has dissolved. Put aside to cool. This will give you approximately 150ml / 5oz of sugar syrup. A ‘Basil Ginger Drop’ tastes great even without the ginger. Vodka can do more than just get you drunk, It can be used to kill both germs and mould. It can even keep your flowers fresh! Dip your razor in vodka – it will disinfect the blade and prevent it from rusting. No need to go to the dry-cleaner, vodka kills the bacteria that cause body odour. Spritz a vodka dilution on your garments, hang them up in an aired room – the smells will vanish (won’t help with stains though). Clean your glasses with a vodka-water mix (add a few drops of dish soap). Extend the life of your cut flowers! Adding a few drops of vodka and a generous pinch of sugar to their water will stimulate ethylene production. Change daily! This entry was posted in Food, Food Photography, Food Styling, Recipes and tagged restaurant, vegetarian by Françoise La Prune. Bookmark the permalink. I’ve been wanting to create this for ages,finally decided to search it just now and Hey presto! Thank you for sharing! I lived in shanghai for 8 years and this was one of my favourite drinks!! Oh my god thank you so much!! I’m visiting my cousin in Shanghai right now and yesterday I was at Sechuan Citizen and had the Basil Drop cocktail. I was dying to find a recipe, that’s awesome! How do you get as much foam as they have at Sechuan Citizen though? It almost looked as if they had used a milk foam thingy to make it, do you have any idea about that? Hurry up and grow basil! 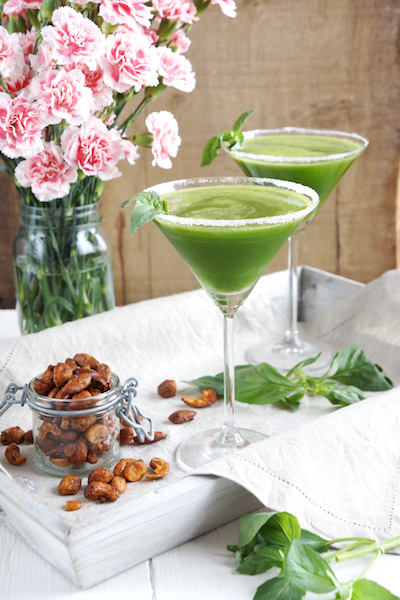 A basil cocktail – Yum! !